If you remember from the ending of the quest, Land of the Goblins, you were required to kill five goblin priests to receive some historical information from them. All five were buried in the burial grounds in the back of the underground Goblin Temple, which is under the Goblin Dungeon. This is where this mini-quest starts. 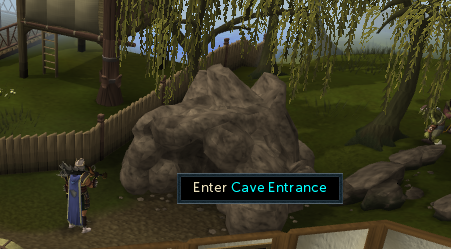 Head to the Goblin Dungeon near the Fishing Guild and move toward the Goblin Temple entrance. There are a couple of ways to reach this point, so select one from the "Recommended Items" section above. Make sure you have a Goblin Transmogrification Potion, Ring of Visibility, and a Ghostspeak Amulet. Before entering the temple, drink a dose of the Goblin Potion and change into your goblin of choice. Once your human body is small and green, enter the temple. Run across the temple to the northern-most wall and open the circular door into the burial grounds. Note: If you dropped or drank all of your Goblin Transmogrification Potion, you can make more. Obtain a water-filled vial, toadflax, and Pharmakos berries. Pharmakos berries can be obtained by speaking with the Makeover Mage. This also applies after completing this quest. You can always return to the Makeover Mage for more berries for more potions you might want to make in the future. You should be in a familiar area. This is where the five priests' tombs are. There is another goblin in the area, only you cannot see him at first. Equip your Ghostspeak Amulet and Ring of Visibility, disabling your Goblin form. You should now see a floating, white object. That object is a goblin ghost, who is just named Ghost. 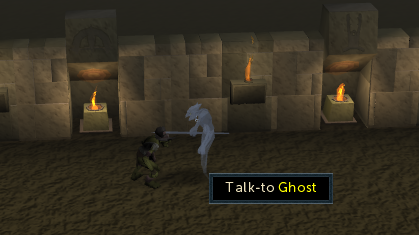 Approach the ghost and begin a conversation. Ghost will be surprised that you can see him and understand, like every other ghost you try to talk to. He will ask you who you are. You can reply with your RuneScape name, your Goblin name, or ask the question, "Who are you?" For the sake of this guide's comprehension, select the last question, "Who are you?" You will now know Ghost's name. Hopespear wants to know your name, so give him your human RuneScape name or your Goblin name. It doesn't matter which name Hopespear learns. After the name ordeal, you now have a variety of questions to ask Hopespear. You can ask about the Big High War God, the Chosen Commander, and other things. It's up to you if you want to learn more about the Big High War God and the Chosen Commander. Of the list, the question you should ask is, "Why are you here?" Hopespear will explain himself. 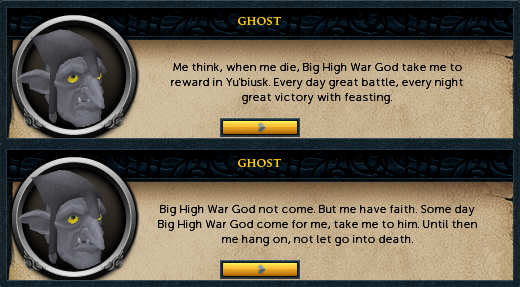 Hopespear believed that when he died, the Big High War God would bring him to Yu'biusk to rest in peace. Unfortunately, the Big High War God never came. After Hopespear tells you his story, you'll have the option to tell him you've been to Yu'biusk. Select that option. When the five priests died, they believed that their spirits would return to Yu'biusk and they could rest in peace. Sadly, that did not happen and their spirits still remain in the burial grounds. Your task is to take the bones of the five priests, bring them back to Yu'biusk, and bury them. When Hopespear asks if you will do his favor, responded with a yes. Your character will ask a question about how to obtain the bones, and Hopespear will explain that you need to kill them without equipment or magical attacks. Once the conversation is over, it's time for some fighting. As mentioned above, you'll need to resurrect the priests by saying their names and killing them without equipment or magical attacks. Some of you might think ranging the goblins will work, but it will not because the bow and arrow is considered a weapon. You'll need to fight these goblins with a fistfight. Prayers do work and you're allowed to bring food. For low-leveled prayers, food and Prayer Potions are recommended. For high-leveled players, a little amount of food and no prayer potions will suffice. Mosschin uses a melee and range mix. Redeyes uses a melee, range and magic mix. His magic spell weakens you. Strongbones uses melee, range and magic mix. His magic spell weakens you. He summons skeleton goblins (level-15) to fight you. Once at the tomb, select the option to say a name, and say, "Snothead!" The undead goblin will appear and you'll need to kill him. Once dead, take his bones and move onto the next one. This is the same process for all the goblins. Move horizontally across from Snothead and kill Snailfeet the same way. Once you have the bones, move diagonally and kill Mosschin, and then horizontally across to kill Redeyes. 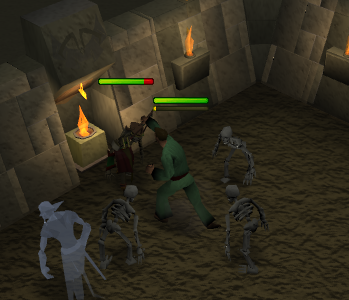 Lastly, head to the northern most tomb and resurrect Strongbones. Focus on killing him and ignore his skeletons. Once he is dead and you have his bones, the skeletons will die, too. Now that you have all five bones, it is time to bury them in Yu'biusk. If you remember from the quest, Land of the Goblins, you entered Yu'biusk through the Fairy Ring network. You'll need to use Fairy Rings in order to bury the bones, only this time, you won't need to power up a Fairy Ring with special machines. 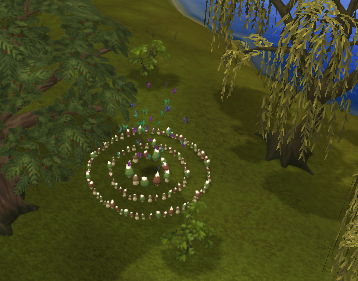 Make your way to the main Fairy Ring in Zanaris. 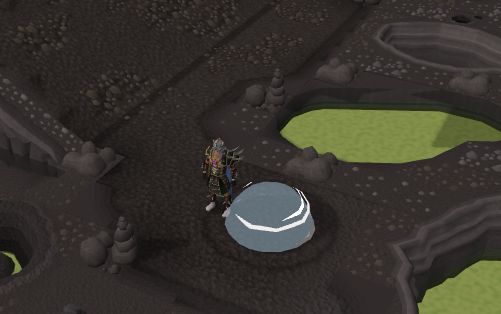 The closest way to enter Zanaris from the Goblin Temple is to use the Fairy Ring outside of the Legends' Guild. Work your way there and use the ring. Make sure you have equipped a Dramen Staff or a Lunar Staff. Once you are in Zanaris, enter the code BLQ into the main Fairy Ring. You should arrive in the familiar land of Yu'biusk. Exit the Fairy Ring and bury the five bones anywhere you please. As you bury the bones, you will receive generous prayer experience. Once the bones are all buried, you will have completed the mini-quest. Congratulations! 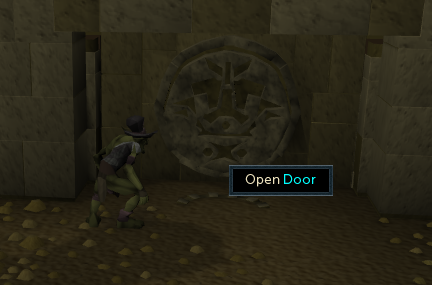 [^] Transform into a goblin and enter the Goblin Temple in the Goblin Dungeon. [^] Head to the back of the temple and enter the burial grounds. [^] Equip your Ring of Visibility and Ghostspeak Amulet. Speak to the Ghost. [^] Skim through the conversation and ask the Ghost, "Why are you here?" [^] Tell the Ghost you've been to Yu'biusk and what it looks like. [^] Agree to complete the Ghost's favor of helping the Goblin Priests. [^] Resurrect the five priests in any order. Kill them without wearing any equipment. Pick up their bones. [^] Exit the temple and find a Fairy Ring. [^] Head to Zanaris and use the main ring to teleport to BLQ. [^] You should arrive in Yu'biusk. Bury the five bones anywhere.